My question is: When will we reach the point where the majority of marketing and communications professionals within healthcare understand and use social media to advance their organization’s business goals? I’m not talking specifically about marketing departments. This applies to people involved in physician relations, referring physician marketing, physician and employee recruitment, and so much more. Through marketing conferences, webinars and industry publications, healthcare marketers have received a barrage of information about the relevance of social media to their professional lives. However, I’m not sure that this same communication has reached other parts of the healthcare organization with the same level of intensity and impact. It amazes me that this remains an uphill battle. 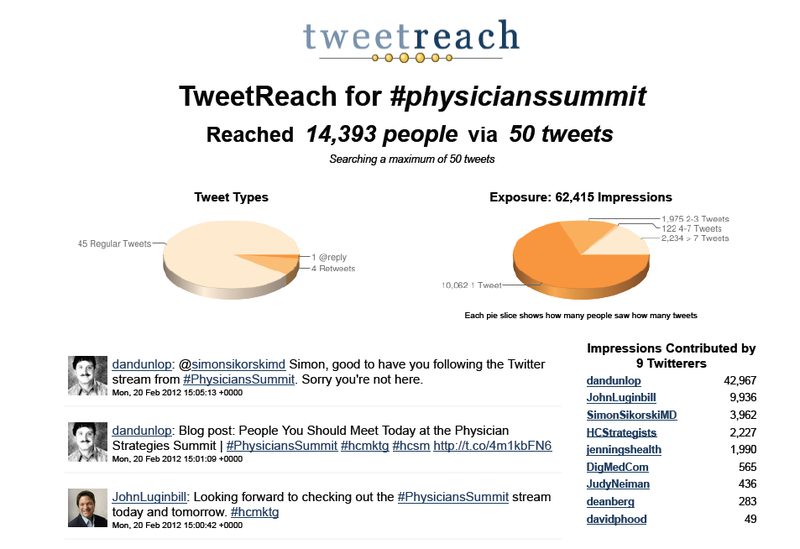 A week ago I attended the Physician Strategies Summit, produced by the Forum for Healthcare Strategists. It was an exceptional conference. The attendees seemed eager to learn and actively engaged the speakers with great questions. And several of the presentations were superb. Below is a screen shot of a TweetReach report showing data for the 50 most recent tweets at the time of the report (Monday, Feb 20, 10am). It tells a similar story: very few people tweeting during the sessions. I don’t know the answer to my initial question, and I acknowledge that social media is not the silver bullet for marketers in our industry. But social media platforms, integrated with traditional marketing tools, can allow for a level of engagement not previously achieved through old school marketing tactics alone. We are now several years into this communications revolution. And every time I think I’ve seen my last Social Media 101 presentation (good riddance), I find that I have wrongly assessed the state of our industry, and Social Media 101 is still relevant. Of course, as I write this, I am preparing to lead a Social Media 101 workshop for a gathering of dentists in North Carolina. As I’ve noted in at least one prior blog post, I have a dental phobia so this should be really interesting. What will it be like facing an entire room full of dentists? Perhaps they fear social media as much as I fear being in the dentist’s chair! I look forward to welcoming them to the world of Twitter, Facebook, Google+, LinkedIn, Pinterest, and so much more! The world of consumer engagement! 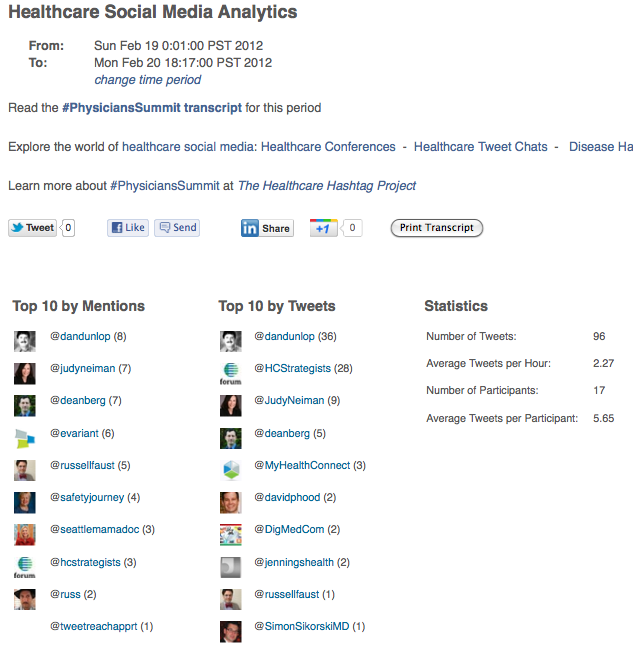 I share your puzzlemennt over slow adoption of social media among healthcare marketers. I’m on social media all the time on behalf of our clients, which are healthcare IT and medical device companies. For those of us in agencies, one impediment is that clients don’t fully see the value of social media, so we are often educating them, “101” style. A bigger impediment, though, is that the purchasing decision makers at healthcare systems are themselves often not on social media. So our social outreach is limited because we are there but some of the people we want to reach are not yet there. Dan and Gregory – I definitely share your puzzlement as well. At my firm, we have had great trouble getting past the “red-tape” of healthcare organizations when it comes to social media. There seems to be quite a bit of push back from senior parties and many have even voiced concerns about privacy and worries of violating HIPA regulations. BUT what I can say (and this is positive) is that we have seen a huge increase in the amount of healthcare organizations reaching out to be educated and to learn more about how social media will support their marketing efforts. This is great to see, as social media is a great way to enhance a marketing plan. While it is not the “golden egg” that many tout it to be, it can really be the oil that makes the marketing wheels of a healthcare organization run much more smoothly.